If you are to buy just one nail polish this season, I think this is it, guys. Do you need a quick pick-me-up? Get Revlon Nail Enamel Provocative. Anyway, isn't this just gorgeous? I usually have no issue with Revlon formula and nothing really chips on me, but I find Provocative applies and wears exceptionally well. It covers flawlessly with two coats but the hint of translucency of gel-creme finish is still there. Absolutely stunning. I have pulled out other orange-y nail polishes of mine for comparison here. 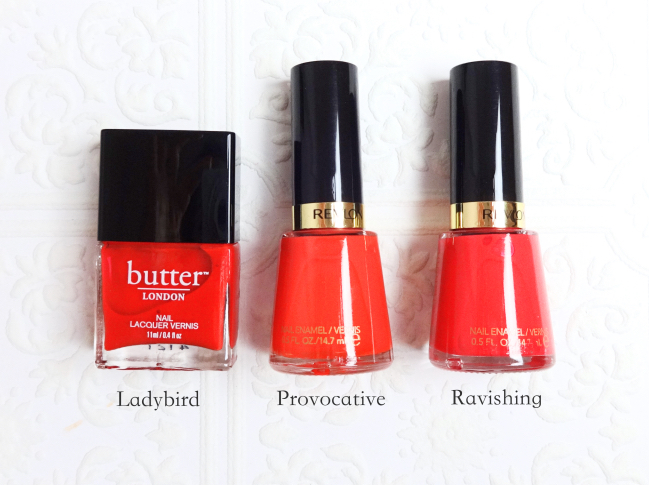 Butter London Ladybird (reviewed) is very similar in finish but it is a bit more red where Provocative is the other way around. 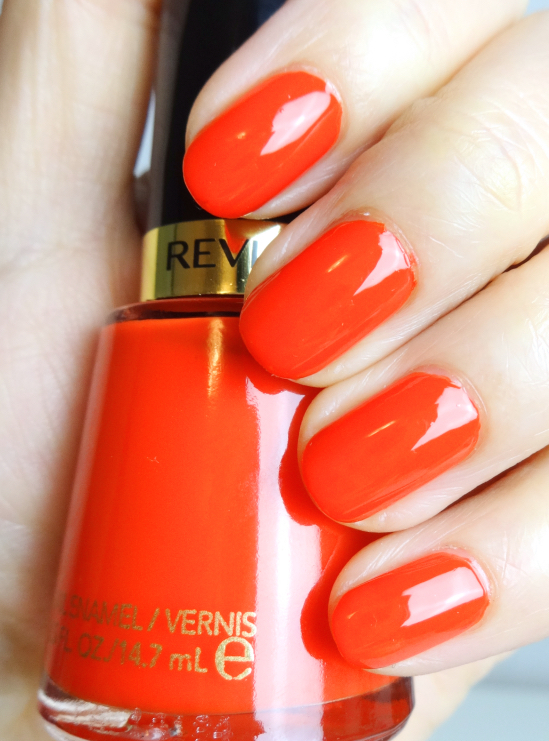 Ravishing is more of a coral with an opaque retro finish, which is a one-coater and also stunning on the nails. Revlon Nail Enamel Provocative is definitely comparable to a juicy high-end orange like Yves Saint Laurent Nail Lacquer Orange Fusion. I hope Revlon does not discontinue this gorgeous shade because I plan to repurchase. Any cheap thrill for you lately? 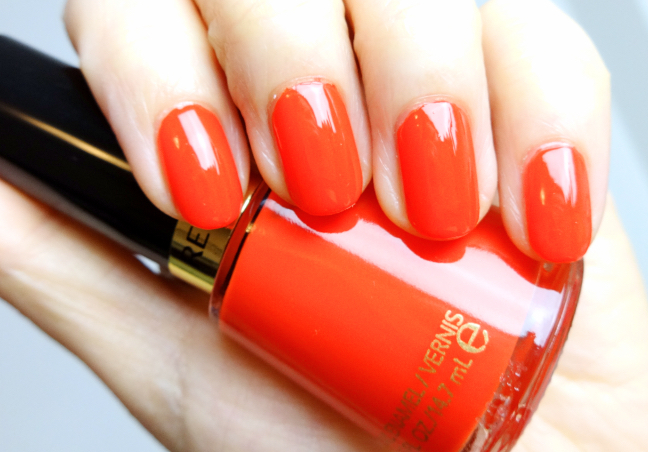 What is your favorite orange nail polish? Ahhh this is BEAUTIFUL on you, Lena! I don't own a lot of orange nail polishes, but I have a couple of corals that basically pull so orange on me that you can't see it's a coral at all (like Guerlain Nahema and Dior Riviera). I do love those in summer! I'm so happy that my first orange nail polish turns out to be so wearable and flattering on me. I've gotten many compliments as well. Those two you mentioned are hot! I need a few more coral and watermelon shades for summer. NICE summer shade on you! This is such a great color! Love it! Oh this is so stunning! I remember one of my first few polishes was a shade from revlon and I really loved how there's this gel like finish without actually being a gel polish! I totally need to see what shades are out right now! Gorgeous colour! Your nails look worthy of an ad :) The application and finish really look flawless and I love the high shine, juicy look that this polish gives. The colour is right up my alley as well. I have tonnes of these Revlon Classic Nail Enamels (I think that's what they're called? ), mainly because you can get them for $5 or less at certain discount makeup shops/chemists :p Much better than the $13.95 RRP. Aww thank you! ;D I don't think I could have pulled a vivid orange like this if not for the gel-creme (almost opaque) finish. With a healthy(?) amount of Sech Vite, it looks like I got gel mani done, too. That has to be one of the most beautiful polishes I have EVER SEEN!!! Do you find Revlon nail polishes take forever to dry?? Even my Sally Hansen Quickdry top coat failed to make them dry quicker..
Actually, I never thought about the drying time. For me, they are about the same when I use Seche Vite fast drying top coat (my favorite but it is full of bad chemicals). ;D To give you a hint, it is also from Revlon. I initially thought about buying another Dior or YSL Glossy Tint, but this Revlon lippie really matches perfectly. It looks jelly! So I wonder what its lipstick analogue(oh wait I think I saw your hint? Lacquer balm in tease?) I actually prefer sinful colors to Revlon when it comes to nail products, formula seems more consistent within the brand. I haven't bought a Sinful polish in a while. Maybe it is time to revisit! Beautiful, Lena! Most drugstore polishes chip on me (although I do have one Revlon that I like - Gold Coin), but I need something like this. So shiny! I've been only buying Revlon polishes (+ L'Oreal occasionally, but they are basically Essie). I've heard some complaints about Revlon formula being inconsistent or bubbling, but I haven't experience any of that. Lucky me!